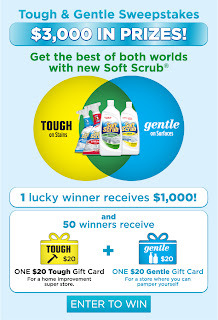 I tried a new household cleaner from Soft Scrub, Tough on Stains, Gentle on Surfaces. The new Soft Scrub Total All Purpose with bleach has a unique nozzle. It can switch from spray to foam with the twist of a the top. Super easy to use. There are times you prefer foam over spray and with this product you can have that choice in one product. I am not typically a big bleach user. I don't care for the harshness of it. There are times though that I feel bleach is the only thing that can get hard on stains, or kill serious germs. Toilets for one are a place I prefer to use bleach. The angled neck allows you to reach those hard places along the rim of the bowl. Showers also often require a bleach product and Soft Scrub meets that need. They also make a Total All Purpose without bleach for those times you want a deep clean, without the bleach. The nice thing about soft scrub is that it is not abrasive and scratching on my counters and tile. It is intense as a cleaner. Enter to win a coupon for your choice of Soft Scrub from A Year of Jubilee Review! 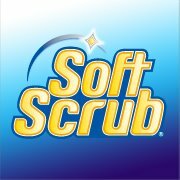 Soft scrub provided me with a free sample in order to better facilitate my review. Howver, all of the opinions expressed here are my own.